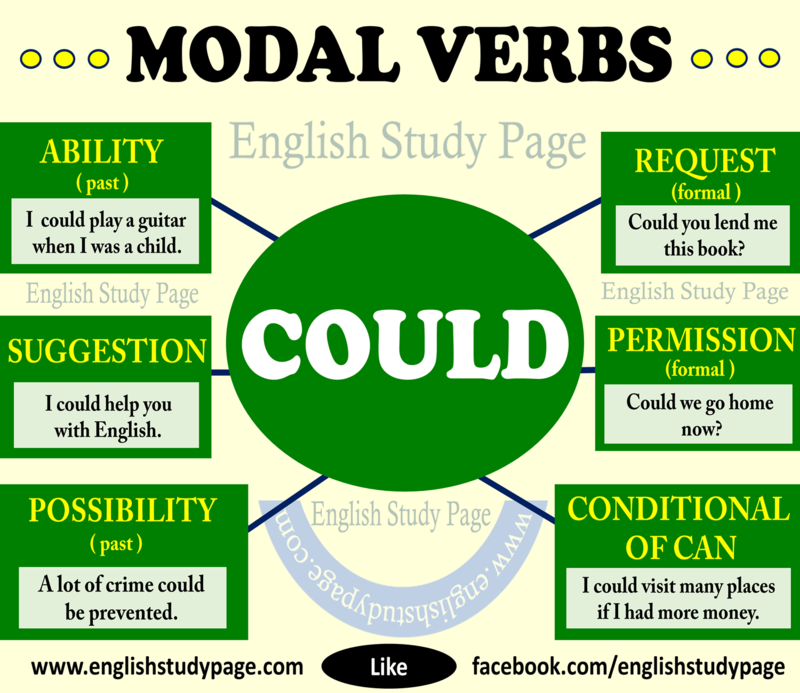 “COULD” is one of the most used modal verbs in English. 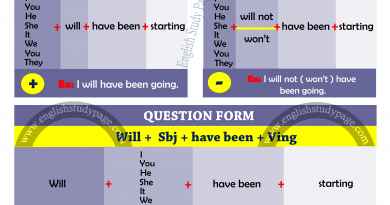 “COULD” is an auxiliary verb ( modal auxiliary verb ). could not –> couldn’t Ex: I couldn’t speak to Mr. Big. 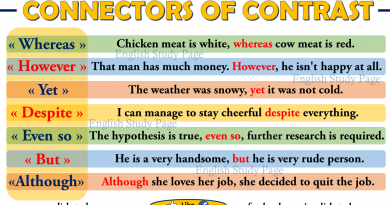 The negative form “couldn’t” is generally used in spoken English and “could not” is generally used in written English. 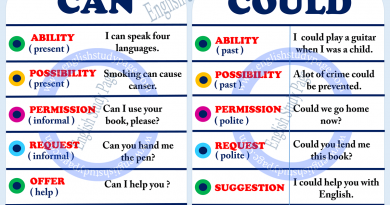 “COULD and/or COULDN’T” is used as the past tense of “CAN and/or CAN’T“. I could speak four languages when I was younger. She could not ( couldn’t ) drive a car. He could play football well when he was a kid. We could not ( couldn’t ) get a job at those times. A lot of crime could be prevented. This new method could be an important step in success. I could call you anytime. Could you lend me this book? Could you tell me where the post office is, please? Could you turn that music down a little, please? Could you please explain this to me one more time? Could I take your book, please? Could I please use your computer? Excuse me, could I just ask you something? Could we go home now? If you want,we could go out for dinner after school? You could always call me every day of the week if it is necessary. You could go out for relax. I could help you with Spanish if you are interested. When we are talking about past time in conditionals, we use “could” instead of “can”. If you called me, I could find you some suggestion. I could visit many places if I had more money. Even if I had more time, I couldn’t study hard. 1. It is used to express a possiblity in the past. I can’t my key. Where could I have put it? They were lucky because they could have died but they didn’t. The computer is closed. The students could have turned it off. Where is Susan? I don’t know she could have fallen asleep. 2. It is used to express unrealised past ability. It means that someone has ability to do something but she/he didn’t try to do it. We can say that it is a form of critism. I could have bought a new house but I didn’t buy. You could have told us about this. Why didn’t you? We could have learned to play any musical enstruments last year. She could have spoken any languages she wanted. He couldn’t have this house. He is poor. It couldn’t be my book. I wrote my name at the top of the first page. He couldn’t draw this picture. He is not good at drawing.